WASHINGTON -- Low-income students are increasingly bypassed when colleges offer applicants financial aid, as schools compete for wealthier students who can afford rising tuition and fees, according to a public policy institute's analysis of U.S. Department of Education data. The study by The New America Foundation said that colleges, in their quest to advance their U.S. News & World Report rankings, are directing more financial aid to high-achieving applicants in a bid to elevate the profile of their student population. "A lot of them (colleges) go for the same students from the rich suburban schools," said Stephen Burd, the foundation's education policy analyst who studied the data. The U.S. News rankings of colleges and universities have become a popular gauge of the quality of an undergraduate and graduate institution's education and the prestige of its degrees. As part of their strategy to compete for the best students, colleges use merit-based aid, which does not take into account financial need. Under this strategy, institutions may, for instance, give four $5,000 awards to lure four wealthy students rather than award $20,000 to one needy student, the organization said. While the federal government issues guidelines on distribution of its grants, it doesn't regulate aid from an institution's coffers. Colleges have fiercely fought efforts by lawmakers to force greater transparency in financial aid practices. Colleges, many under tighter budgets as they offer more amenities and hire the best professors, are under pressure to raise revenues and are using tuition prices to do so. The cost of attending a four-year public institution has gone up by 5.2 percent each year in the last decade, more than the inflation rate, according to the Consumer Financial Protection Bureau, forcing more students to take out loans to pay for tuition and fees and giving them a heavy debt burden when they graduate. The annual cost for tuition, room, board and fees at many private colleges is between $30,000 and $45,000 a year. The New America Foundation analyzed net price data -- the amount students paid after all grant aid was exhausted -- to conclude that hundreds of colleges expect the neediest students to pay an amount equal to or even greater than their families' yearly earnings. For instance, of the 479 private, nonprofit colleges examined, 89 percent charged students with family incomes of $30,000 or less more than $10,000 in net prices and 22 percent expected students to pay about $20,000 or more each year. Needy students then rely more heavily on student loans, either drop out or take on full-time jobs, which diminishes their chances of completing school, the study said. "I fear that we're going to have more social stratification and there are going to be fewer opportunities for upward mobility," Burd said. While the practice is more predominant in private colleges, Burd said, it is increasing in public colleges, many of which are receiving less money from cash-strapped state governments. 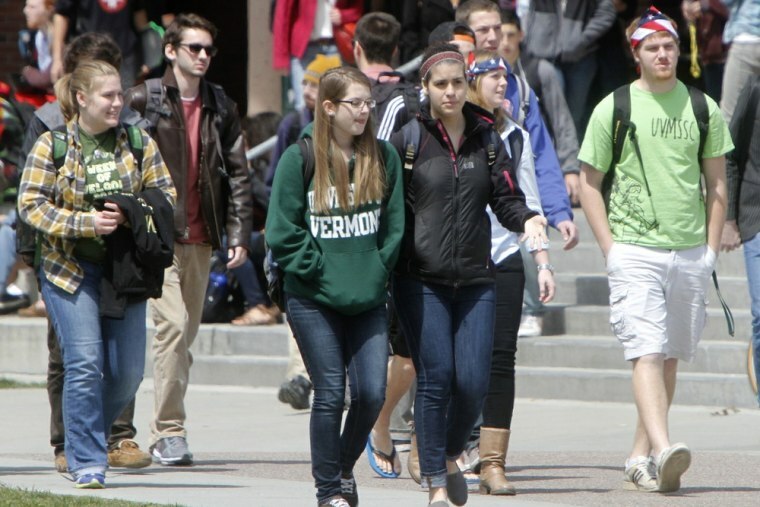 But some schools, such as private Amherst College and Massachusetts Institute of Technology, have enrolled more lower-income students without jeopardizing their prestigious status. There is nothing illegal about this approach to doling out aid, Burd said, but it undermines the strides made in creating opportunities for the nation's needy. Burd proposed a carrot-stick solution in which institutions that admit more low-income students receive more federal aid and those that enroll fewer low-income students but charge them higher net prices would be required to match a share of the Pell Grant aid they receive. Pell is a federal program granting aid to bright low-income college students. "We've wanted as a country for the last 50 years or so to try to help lower-income students move themselves up the ladder of opportunity, and higher education has always been that kind of ladder. And so the idea that we may be closing these gates is very alarming," he said.